Many patients have asked Dr. Sobel and me for our opinion on Question 1, the ballot action in the upcoming Massachusetts election November 6 that would regulate and set staffing standards for nurses in hospitals in the Commonwealth. We believe you should vote “No.” Let us explain our thinking. We agree there are problems of inadequate nursing staffing on many hospital units from time to time. Hospitals have been evolving for the past 20 years into pervasive and complex critical care units where people as patients are admitted for highly intensive short-term evaluation and treatment, with constant reevaluation during the course of each day. The best efforts of hospital clinical and administrative management do not result in consistently flawless care. We all know that. However, the detailed and rigid staffing requirements in Question 1, including stiff financial penalties for nonperformance, are unsettling. The timelines (such as full implementation on January 1, 2019) are close to ludicrous. Clinical staffing is immensely complex and involves not just nurses, but a universe of related and support personnel (from aides, to physical therapists to dietitians to social workers). We don’t begin to have data to support the detailed and time-dependent staffing standards in the proposed law, nor have carefully researched scenarios been published as to what happens to the other clinical personnel when money for registered nurse staffing is dramatically increased. Not to mention where all those additional nurses will come from. In this case we respect the negative responses emanating from the major teaching hospitals. A ballot question is just not the right vehicle to improve the situation, and this proposal may make things worse. By the way, there are many other major problems in health care that get insufficient attention. The cost of prescription drugs. The restrictions imposed by insurance networks discouraging patients from going out of network for care. The underfunding of primary care practices, which is why patients in most standard practices have a hard time actually seeing their official primary physician. And by the way, imaging studies (MRI’s and CT’s) are vastly overpriced, leading to insurer’s efforts to restrict access to them. Should we get some of these on the ballot? Or should public commissions or legislative study groups be a better vehicle to define needed improvements? We don’t have plebiscites to determine staffing at Walmart checkout lines. We all know there are plenty of cash registers. We can see them. We just wait, or go to Target. Somehow since RomneyCare became law, we’re all managing Massachusetts’ healthcare. We’re all able to make decisions about how long we want to stand in line to buy deodorant and how much more we’ll pay to wait less. When we’re at hospitals as patients or visitors, we note the small clusters of nurses discussing this and that, while non-ambulatory patients ring for non-urgent support. This measure is the first sledge hammer to fix the healthcare system’s out-of-control cost structure. What other choice have we? There was a time when the federal government and private insurers dictated hospitals’ rates, behind closed doors. Now with government mandates for individuals and insurers, the pricing is political—-so are the costs apparently. This measure is an effort to control labor costs in healthcare. 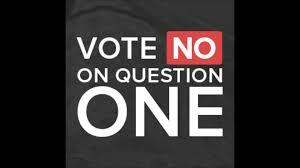 Voting “No on 1” will not eliminate the need for political cost control. It will move it off the ballot and into the anterooms of the legislature where “we the people” have little power and lobbyists have tons.